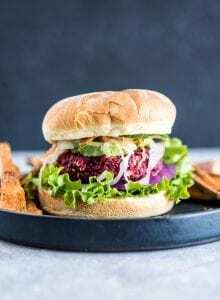 These beet burgers are good, whether or not you serve them with the garlic aioli, you’ll love the delicious flavour and texture. Try the patties served on a salad or on a bun with the aioli and fresh lettuce, tomato, avocado and onion. These burgers are vegan, gluten-free, oil-free and sugar-free. Add the diced onion, garlic and grated beet to a pan and cook for 7-10 minutes until softened. While they’re cooking, add the oats to a food processor and process into flour. It’s okay if it’s a little grainy, it doesn’t have to be super fine. Add the rest of the burger ingredients to the food processor, including the cooked beet mixture and mix until well combined. It should be quite smooth but not totally processed, a few chunky bits and bites are ok. Shape the mixture into 8 patties. Heat a non-stick pan over medium heat and add some non-stick cooking spray. Add the patties and cook for about 5-10 minutes per side. I kept flipping them over for about 15 minutes until they were nice and crisped on the outside. Just make sure the pan isn’t too hot so you don’t burn them. To make Spicy Vegan Garlic Aioli, blend together 1 container soft tofu, 3 tbsp sriracha sauce, 1 tbsp pure maple syrup, 4 cloves garlic, 1 tbsp fresh lemon juice, 1 tbsp apple cider vinegar and 1 tsp sea salt.